Home theater for music lovers. Epic sound for all your movies, games and TV shows. Streams music, too. For those times when all you need is a song. PLAYBASE has a slim tabletop design that practically disappears underneath your TV. PLAYBAR looks great mounted on the wall. Either way, you’ll hear the full range of sound effects and music from the left and right channels, and crisp, clear dialog from the center. PLAYBASE and PLAYBAR amp up every movie, game and TV show with widescreen, 3-channel sound. The Sonos® Wireless HiFi System lets you stream all the music on earth in every room. Start with one room, then, expand anywhere to fill your home with wall-to-wall HiFi sound. Control all your music with free apps for your Android® smartphone, iPhone® or iPad®. What is Sonos? – Sonos is an Internet-Based music solution that provides an unlimited amount of audio content. Sonos has a range of products, from smart speakers to soundbars for home theaters, that allow you to tailor your music to your needs. See the entire product list by clicking here. How does it work? By using a combination of your high-speed modem and WiFi network, the system uses multiple “players” that can be connected to an existing stereo, stand-alone speakers and/or an all-in-one portable desktop speaker. A Sonos handheld touchscreen remote and/or an iPad, iPhone, iTouch or Android device is then used to choose the room, the music and the volume. Read more about controlling your Sonos system here. What can be played? You can access music from your computer (i.e. iTunes), iPods, 1000s of Free Internet Radio Stations, Rhapsody, Sirius-XM, Spotify, Napster, Wolfgang’s Vault, Rdio, and more… (Some are subscriptions and some are free) The beauty of the system is that it’s software upgradeable and new services are being added all the time. Is it complicated to use? If you can use an iPod, you can master the system within minutes. Currently, there is no other system that offers this much content while being so simplistic to use. Is it expensive? Hands down, Sonos is the most robust and sophisticated system being offered at such a cost effective price point. How can I get it? That’s the easiest part. Just call All Media Consultants to schedule a Free Site Survey*. 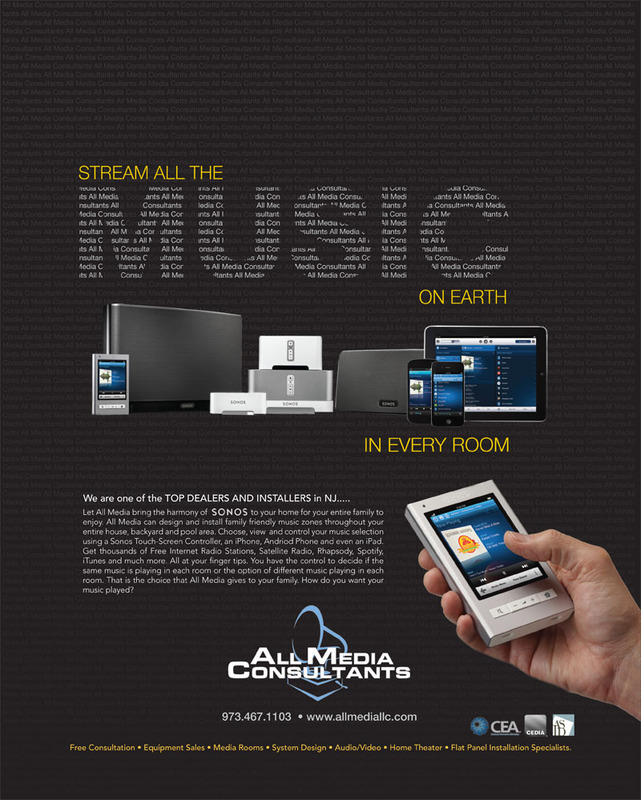 We will come to you to discuss how to best implement a Sonos solution tailored to your needs. Oprah Winfrey names the Sonos PLAY:5 Speaker on her 2015 “Favorite Things” Holiday Gift List! Our team is working in Madison, Chatham, Livingston, Short Hills, Springfield, Millburn, Summit, Florham Park, Tenafly, Paramus, Fairlawn, Teaneck, Hackensack, Morristown, Hanover, Parsippany and all surrounding NJ towns.